In 2008, Enloe Hospital called upon local artists to create art panels for the new parking structure as part of their planetree philosophy. 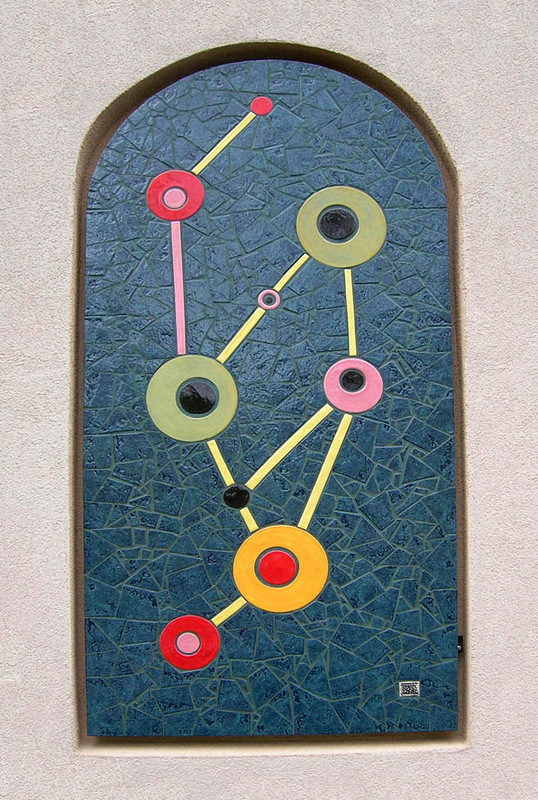 The planetree philosophy put simply is one that suggests art helps the healing process. There are nine arched panels, each one is three feet wide by five feet tall and each done by a separate local artist. �Here is the one I did, titled “Connected”. It explores the idea that everything in life is connected whether the connections are visible or not. �I decided to play with an abstract design that had a micro-organism feel. I think it is comforting knowing that we are all connected and part of something greater than ourselves just like the cells in our body work together to hold us together. �That is an idea that I think would help myself and others heal. I wanted the colors to be vibrant like life itself when it’s at it’s best.�All of the circle and stick tiles are handmade by me. The teal�background is smashed commercial tile.